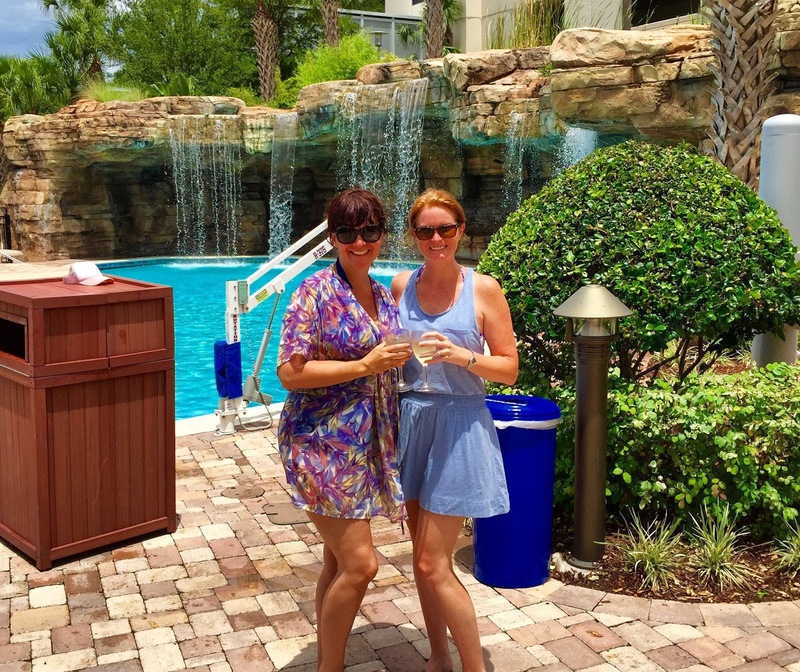 This weekend my husband Gabe and I had a quick staycation at Hyatt Regency Orlando. 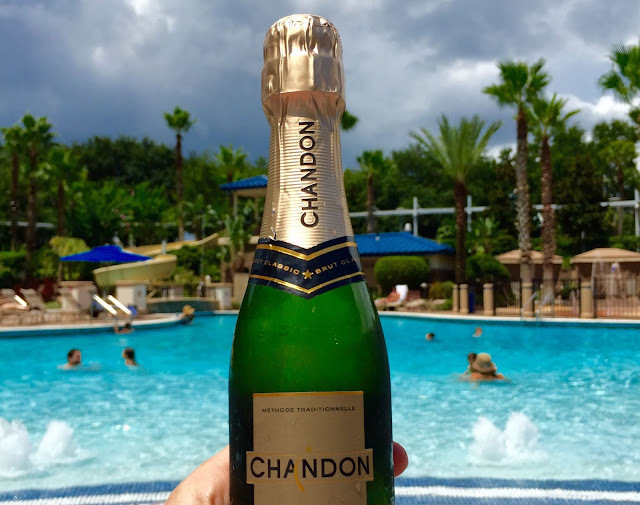 We had a work function at SeaWorld which is 5 minutes from the property and instead of rushing home, we decided to enjoy sometime in the I Drive area of Orlando. Our friends Darlynn and Steve happened to be staying at the Hyatt as well and we had a wonderful time playing tourists in our own back yard. It is amazing to see all of the improvements going on in that area. This stay would mark the 6th hotel I stayed at in the month of June. I have been traveling a lot for work and in my downtime, taking quick trips to try and relax. I did exactly just that this weekend. Gabe and I stayed in a King room overlooking the pool. I am not sure what it is about Hyatt Regency Orlando but have the most comfortable bed I have ever stayed in. I typically find myself up bright and early while staying away but not last weekend - I actually slept in (until 8:30, ha!). 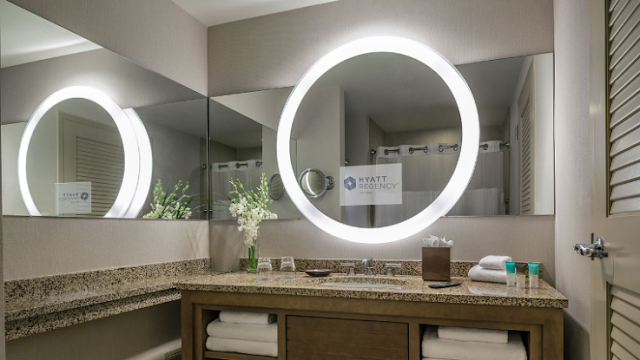 One of my favorite features about Hyatt Regency Orlando is the bathroom. Yes....the bathroom. There is a TV mounted in the mirror. When we end up buying a house, this is one thing Gabe wants to put in our master bath. I will not argue with that! Hyatt Regency Orlando also had amazing toiletries. As I mentioned above, I spent nearly half the month of June in hotels. I cannot tell you how many times I forgot my toothpaste and face wash. I need not to worry when staying at the Hyatt. Not only did they provide toothpaste and mouth wash, Hyatt has KenetMD skincare as their toiletry line (this stuff isn't cheap). On top of your standard shower gel, soap, shampoo and conditioner, you also get face wash and after sun gel. That is taking care of your sunburned guests if I have ever seen it. As you can tell, I am passionate about my toiletries! Walker Stalker Con was happening at the convention center next door to the Hyatt. We went for cocktails at the Rocks Bar following our incredible dinner we had at Firenzo. It was people watching at it's best. I saw more people dressed up like Walking Dead characters. Sadly I didn't get any photos of them - but we enjoyed quite a few martinis at the beautiful bar! 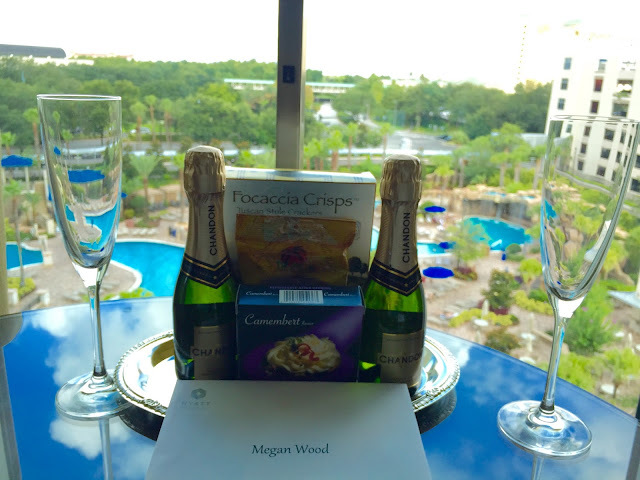 Upon returning to our room, I noticed that Hyatt spoiled me with a champagne and cheese basket, which I saved for Sunday morning, knowing I would be spending time at the pool. This is what I call practicing self control because I really wanted to tear into that basket and drink the Chandon. 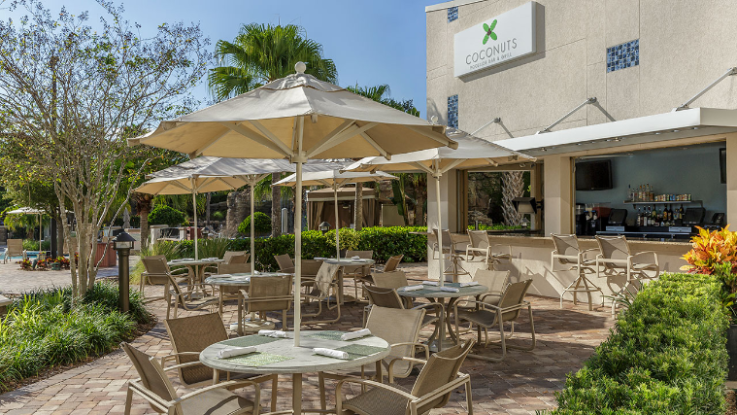 We also enjoyed lunch at Coconuts Poolside Bar and Grill during a short FL rain storm on Sunday. Coconuts has a great menu with multiple appetizers, signature sandwiches and salads. Darlynn and Steve ordered Seafood Salad Club which is a Florida version of the Maine Lobster Roll. It contained crab, shrimp and lobster. This sandwich was $18. Since I am on a soft food diet, I had to get something easy to eat. 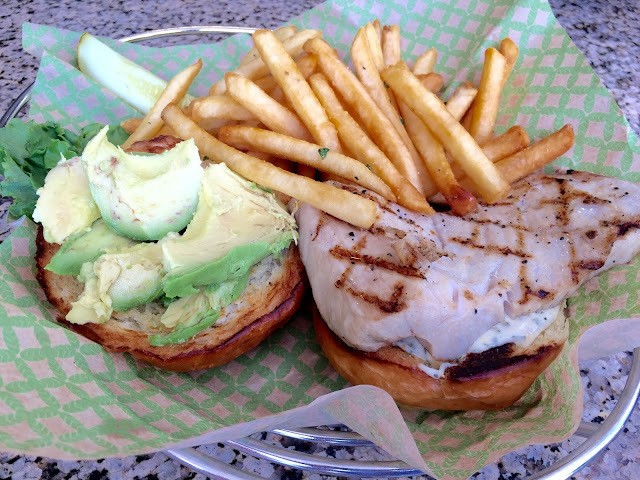 So I ordered the Grilled Florida Fish Sandwich, subbing the tomato for avocado and ate it without the bun. It was also $18 and very good. There is a bunch going on at Hyatt Regency Orlando this summer including Summer Sensation activities and a great FL resident discount. 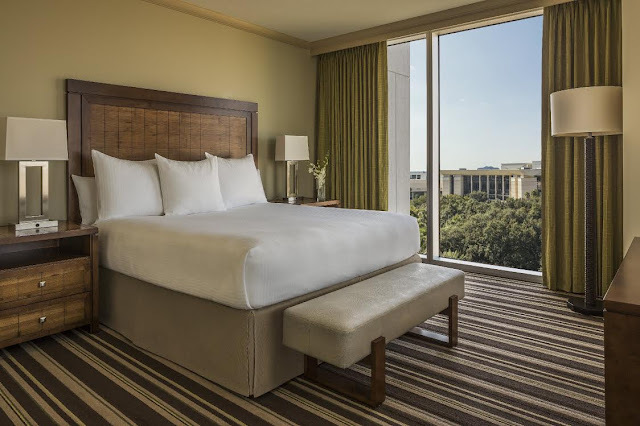 Pair spacious accommodations, world-class amenities and service with convenient location -- minutes from Orlando's world-famous attractions, shopping, dining and nightlife -- for an experience unlike any other at Hyatt Regency Orlando. Enjoy exclusive savings of 20% on weekend staycations for Florida residents, and stay in the middle of the action. Learn to swim like a mermaid at the Grotto Pool, a luxurious oasis with cascading waterfalls, cool water slide and cabanas for families to relax and unwind. The Mermaid Academy offers children of all ages to play and swim with a vibrant mermaid tail or shark fin in this magical experience, offered Wednesdays and Saturdays at the Grotto Pool. Classes are available at 11:30 a.m. and 12:45 p.m. for $30 per child. Take the experience home with a collection of fun mermaid tails available at The Spa at Hyatt Regency Orlando. Learn more and reserve your child’s Mermaid Academy experience, and call 407-345-4431 for reservations. Entertainment and Activities, All Summer Long! Orlando is the ultimate summer destination with the most fun and excitement for families, couples and friends alike. Discover all there is to experience in Orlando when you stay in the middle of the action, minutes from world-famous theme parks and International Drive attractions like The Orlando Eye. And, don’t miss exclusive hotel activities, live entertainment and more all summer long. 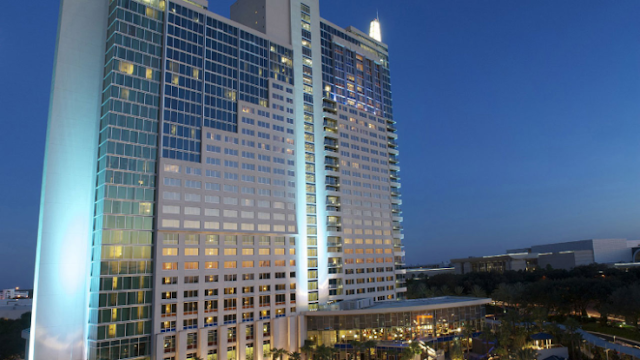 You can find the entire weeks worth of activities online - click here to be taken to Hyatt Regency Orlando's website. Below are what you will find on the weekend.